Scoliosis is an abnormal, often progressive curvature of the spine that also causes the spine to rotate. Danville, CA spine surgeon Robert Rovner, MD has developed a new technique and surgical hardware to more fully correct the spine’s rotation for the first time. This rotation can create a telltale “rib hump” which is not fully corrected by conventional surgical procedures. “I believe this procedure can provide the best outcomes compared to the currently available treatments for scoliosis,” says Dr. Rovner. Dr. Rovner’s procedure employs a device that allows the surgeon to make the spine as straight as possible by enabling adjustments from both sides of the spine, instead of from just one side. 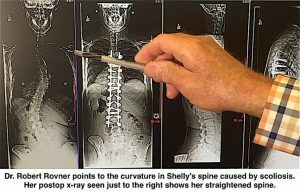 “Conventional surgeries focus on correcting the curvature deformity but will only slightly correct the rotation of the spine,” he says. Robert Rovner, MD is a board certified spine surgeon at Disc & Spine in Danville, CA.